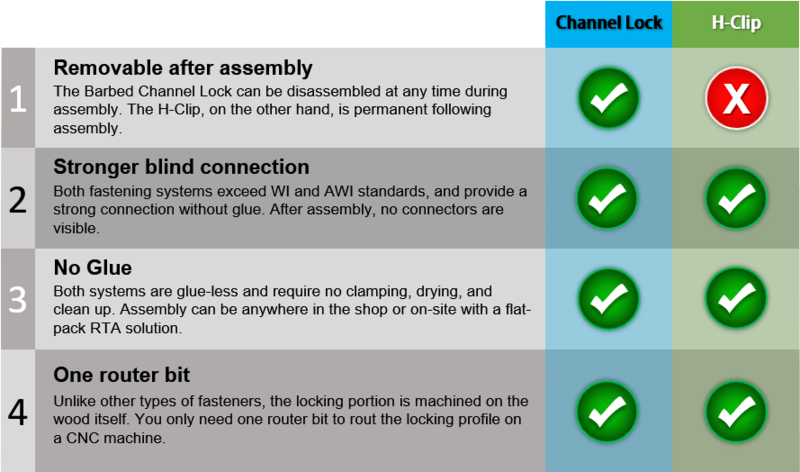 In essence, the Channel Lock fastening system was designed with disassembly in mind, while the H-Clip fastening system mirror that of a glue-and-dowel construction method, only with no glue necessary. You can decide which system works best for your business model. Either way, you are going to save a lot of time, money and headache. In addition, we are constantly launching new innovative technology to simplify manufacturing, assembly, and installation. 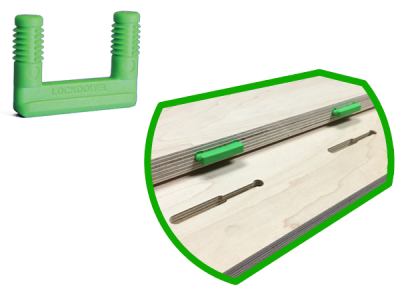 To eliminate the glue requirement when construction a cabinet with no visible fasteners and comparable strength, we designed the interference of the barb geometry and keyhole slot to perfection. Together, each Channel Lock joint provides over 100 lbs of pull force and once assembled, no fasteners are visible. Without glue, cabinets can be disassembled for flat shipping, rework, or replacement. Simplicity in design, the fastener naturally reduce the assembly process. The channel lock slides firmly inside the keyhole slot. With practice, a base cabinet can be assembled in 2.5 minutes, and a drawer box in 30 seconds. 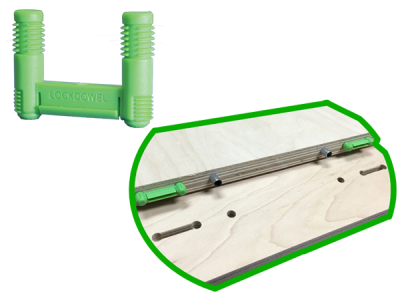 Every product we have converted to Lockdowel shows a significant increase in assembly time by as much as 60%. • 100 Barbed Channel Lock (E900BP) and 50 Spring Pins (8002-40-R5) to build up to 7 units. • 100 Barbed H-Clip (E910BP) and 100 Spring Pins (8002-40-R5) to build up to 7 units. We’re here for you. Get help selecting the best system to simplify your life.